Today's Veal - Welcome to the Farm! 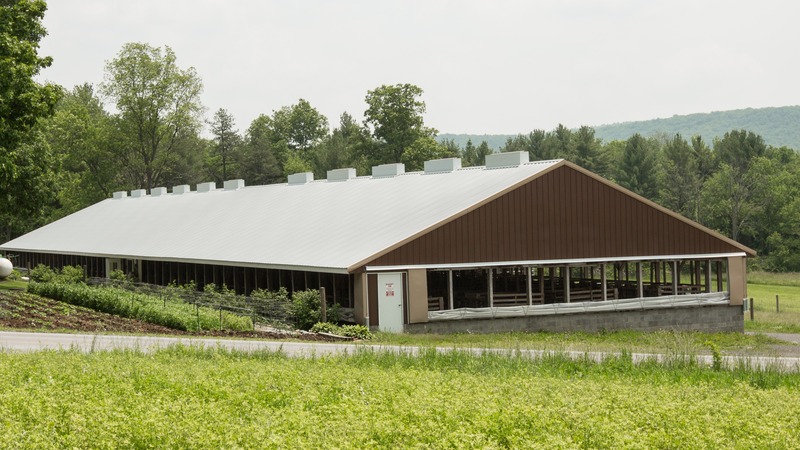 The story of veal starts at the dairy farm. When a mother cow is bred on a dairy farm and give birth to a female or heifer calf, the calf stays at the dairy farm and joins the other milk-producing cows. If a male or bull calf is born, he is sold to farmers who raise him to a full grown 1,200-1,500 pound beef animal or to a 500 pound veal calf. Veal farmers purchase dairy calves when they weigh 100 pounds and raise them until they are 5-6 months old. Veal calves live indoors, protected from extreme weather conditions and predators, in group pens where they can socialize and receive food and veterinary care. 700 farm families raise veal calves in the United States. When calves reach 500 pounds (5-6 months old), they are sent to a packing plant where they are humanely processed into veal for sale in supermarkets and restaurants. A standard 3 oz. serving of many veal dishes are less than 400 calories and packed with nutrients. Put veal on your plate and discover that it is not just nutritious, but also delicious. THIS VIDEO IS COURTESY OF THE AMERICAN VEAL ASSOCIATION. MAKE IT MEMORABLE. MAKE IT VEAL. Veal is not only delicious and nutritious, but it is also easy to prepare. Click on one of our recipes for a quick and easy meal solution, or create your own veal masterpiece using one of the traditional Cooking Methods. Veal Meatloaf Cupcakes – delicious and kid-friendly! Find two veal recipes developed by Pittsburgh-based blogger Carla Cardello of the Homemade in the Kitchen blog below. Head on over to www.vealmadeeasy.com for additional recipes, cooking tips and much more! We partnered with Pennsylvania blogger Carla Cardello to develop a new and innovative recipe utilizing ground veal. A twist on classic Shepherd’s Pie allows this meal to be on the table in under an hour – perfect for chaotic weeknights. This Veal Stroganoff recipe was developed by Pennsylvania blogger Carla Cardello. This recipe is youth-friendly, a great recipe for beginners. This stroganoff will sure to be a family favorite! Put simply, veal is a nutritional power source. Recent USDA data reveals that a 3 oz. cooked, trimmed serving of veal provides less than 10% of the calories recommended for a 2,000 calorie diet. 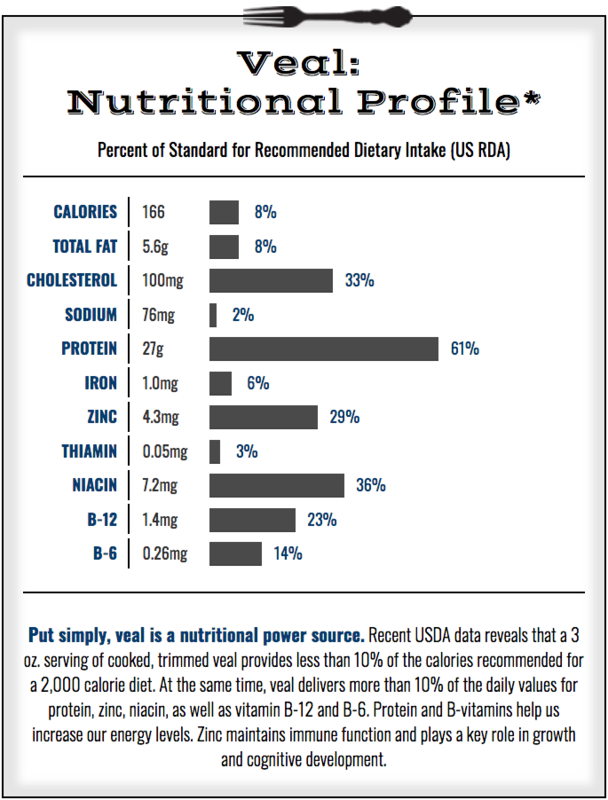 At the same time, veal delivers more than 10% of the daily values for protein, zinc, niacin, as well as vitamin B-12 and B-6. Protein and B-vitamins help us increase our energy levels. Zinc maintains immune function and plays a key role in growth and cognitive development. Veal is nutritious – an excellent source of protein, iron and vitamin B-12. Veal is delicious – offering a delicate flavor and versatility. Veal is easy to prepare – try sautéing, stir-frying or grilling!